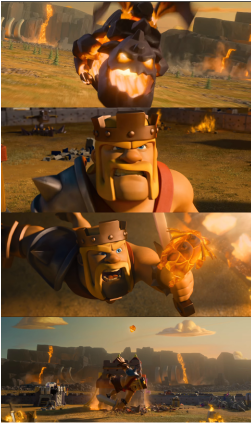 Clash of Clans "Legend of the Last Lava Pup"
For this commercial, Proof, inc.'s previs team worked at the lovely and inspiring Venice office of video production house Psyop, inc. The team there was very friendly and accommodating, which made collaboration easy. We were able to use their rigs, and build on the series of successful commercials the studio was known for over the years. Playing with the scale of the characters and the layout of the base were the most slippery variables to manage, but by the end, we balanced those across tens of shots. Each previs artist was responsible for continuous "chunks" of shots, so the background environment was arranged according to each previs artist's taste. The actors in the live action shots were still being decided on while we worked, but ad agency Barton F. Graf 9000 ended up casting Christoph Waltz and James Corden in the end.